We needed heroes after the financial crisis. Instead we got bureaucrats, compromisers, and perhaps something much worse. Federal law enforcement officials, our “thin gray line” against banker crime, were charged with restoring the balance of justice and reducing the threat of future crises. Seems they had other things on their minds. Now the Obama administration’s first-term posse is riding off into the sunset. The most visible departure is Deputy Attorney General Lanny Breuer. Remember those submissive or avaricious sheriffs in the old Westerns, the ones who were always letting the bad guys run wild ? “Sorry, Ma’am, I’d like to help you and the boy but there ain’t nothin’ I can do.” That’s Breuer, whose shattered credibility and extreme reluctance to prosecute has become the stuff of legend. All it took was a well-edited compilation of his own words on PBS’ Frontline to spur an announcement of Breuer’s unscheduled resignation. (Mary Bottari has the Frontline highlights.) They’re denying any connection between the program and the resignation, of course, but the denials ring false. Breuer was already on the record in a speech before the New York City Bar Association as saying that “we must take into account the effect of an indictment on innocent employees and shareholders” at major Wall Street firms. That’s like not arresting Tony Soprano because they’d all be out of a job down at the Bada Bing Club. And note that Breuer did not say “We must take into account the effect of unpunished wrongdoing on defrauded investors, homeowners, or the American and global economies.” The entire premise is bogus anyway. It’s possible to criminally indict individual bankers without bringing down the whole bank. If necessary, the government can assume control of a failing institution to make sure that its workforce stays employed. Besides, when did prosecutors start worrying about stock market value before deciding whether or not to indict suspected crooks? It must’ve been after Wall Street wrongdoing brought down the world economy and shattered global markets. This anarchic reasoning reached its apotheosis (or nadir) with the Justice Department’s recent refusal to indict anyone at HSNBC for laundering money on behalf the murderous Mexican drug cartels. Here’s what that means in very real terms: If you work at a big bank you can fatten your bonus by breaking the law as many times as you want. You won’t even be punished for colluding with crazed drug-dealing killers who have murdered 35,000 people, sometimes by tossing their severed heads onto a club’s dance floor or leaving them in the town square to show everybody who’s boss. We know who’s boss on Wall Street, too. If Attorney General Holder endorses Breuer’s thinking he’s had the good sense to keep it to himself. But Breuer, who met Holder when they both worked for Wall Street firm Covington & Burling, couldn’t resist the temptation to brag. Still, shed no tears. Public shame can be a ticket to Wall Street prosperity. 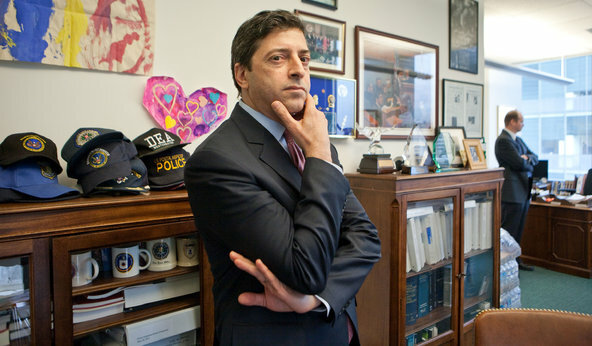 Robert Khuzami was Breuer’s partner in crime non-punishment over at the SEC. Khuzami ran the agency’s enforcement division until his resignation was announced earlier this month. That inspired a Ben Protess puff piece in The New York Times Dealbook page that reads like a regulatory “Fifty Shades of Gray” – call it “Fifty Shades of Gray Pinstripe” – with Khuzami as the “dominant” and the rest of us as “submissives.” We’re told that Khuzami is “an imposing presence with a piercing stare,” an effect he tries to replicate for the camera with lamentable results. We’re also told Khuzami had “a knack for grilling lawyers” who worked for him – a knack that clearly did not extend to bankers under his scrutiny. Note to journalists: It’s possible for a fine to be “record-breaking” in its size and also be inadequate for the gravity of the offense. That’s the Goldman Sachs story – and Khuzami’s. And since the fine was paid by shareholders, not the perps themselves, there’s no incentive not to keep committing the same crimes. Dealbook informs us that Khuzami, the former general counsel for Deutsche Bank, is “is positioned for a lucrative job at a white-shoe law firm.” Tell us something we didn’t know. We’re also told that Khuzami told his attorneys to ask themselves every evening, “How did I add value today?” Which begs the question: Value for whom? Bobby Kennedy took on the racketeers when he ran the Justice Department, and the motto on the Robert F. Kennedy Department of Justice Building says “Justice is founded in the rights bestowed by nature upon man. Liberty is maintained in security of justice.” It may be time to update both the building’s name and the letters engraved on its facade. We’re not saying Covington & Burling is the Justice Department. Think of it more as lead counsel – for the defense, of course. But other firms get a piece of the action, too. Another analysis from Dealbook (which has multiple contributors) noted that senior Justice Department oficial Greg Andres, who worked for Breuer at Justice, went to Covington competitor Davis & Polk. Greg Andres’ new firm also employs Linda Chatman Thomsen, Robert Khuzami’s predecessor as the Securities and Exchange Commission’s head of enforcement. Now Obama has nominated Mary Jo White to run the entire SEC, and lots of smart people are hopeful. It’s easy to lose your edge once you become part of a social circle. Jailing your friends and clients begins to feel unimaginable. Still, White’s got guts and character. Let’s make the forecast ‘guardedly optimistic,’ with some of the ‘guarded’ part coming from concerns about the Justice Department/Covington & Burling gang. They can make her task easier … or much, much harder. It’s the president and the attorney general who call the shots, and who will ultimately be judged by their actions – or lack thereof. Change can only come from the top. What are the prospects? Judge for yourselves: Last week the Obama/Holder Justice Department told producers of the hard-hitting “Frontline” report that “they thought (the bank crime episode) was a hit piece” and that “they will never cooperate” with the program again. Ask not for whom the revolving door turns, Wall Street. As of this writing, it still turns for thee.